The next day the boy went out again in search of food and, wandering into the thicker part of the forest, he meet a tiger. 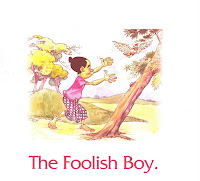 Instead of climbing the nearest tree for safety, the boy looked carefully at the tiger and, on seeing the yellow stripes on the animal, he thought it was a monk. So he knelt down and made obeisance, and the tiger pounced upon him and ate him.